We think of a house as a place that we build and shape to reflect who we are, a place where we experience significant life moments and events. But what if the reverse were also true? What if a house could shape those who enter it to reflect its own being? Affect the way those within its walls experience significant life moments and events? 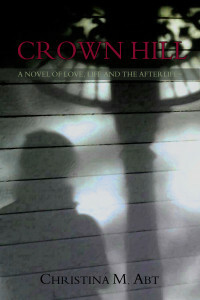 Crown Hill is the story of such a house and the lives of those who were shaped and connected by their experiences within. They include a suspected murderer, an abused wife, an accomplished lawyer-turned-spiritualist, an internationally renowned author and a newly divorced woman beginning again— their tales all told by the one who knows them best—Crown Hill. TO PURCHASE CROWN HILL COMPLETE THE FORM BELOW AND CLICK “SUBMIT” TO PAY VIA PAYPAL (debit / credit card). “The historical parts I think are the most interesting, to me it lets you “meet” the subject. The historical facts I think are what bonds you to the house and characters.” - Jill B. “Christina, I just love all the characters in this book. You write exactly how someone would feel in certain situations. You write with such a nice flow, that really is a gift. I really truly hope this book gets published and sells very well for you! “ - Karen B. “At first I loved your writing style. Then I really liked the story . Now I really love story and the writing style, these last few chapters are just perfect.” - Jocelyn B. “OK, I’m balling my eyes out! God Christina what an ending. The ending really wrapped up this story so perfectly. Then I read the about the author and started crying again.” - Laurie S.
” I just had to tell you that your way with words is just too beautiful for description. Your ability to bridge the 19th century with the 21st century with words and images is really lovely. I felt like I knew Mary and the days in which she lived. I could envy the simplicity of her life while aching for the pain she suffered. Yet I never felt like I was reading language that was unfamiliar to my 2013 literary experience.” - Liz S.
“Here are just a few words that can express the feelings I had while reading your book. They are, curiosity , surprise, warmth, and deep emotional entanglement.” - Bob C.
I wasn’t sure I’d like the house-as-character format. I thought it might be too gimmicky. But I see now how you’ve woven it in. It is a necessary narrator, always there when needed, but unobtrusive when not in the scene. It reminds me of the narrator in Our Town.” - Lisa Z. “I just finished Crown Hill with tears in my eyes. I didn’t want it to end. The ending is perfect— touching, filled with love. Thanks you so much for the privilege of reading your treasure. It is a beautiful book.” - Marion S.
“As a guy who spent his whole career producing plays, I really felt strongly that there is a great play in Crown Hill. A.R. Gurney wrote a play called “The Dining Room”. The play is a series of vignettes that take place in the same dining room. Kids growing up, one kid coming home and finding his mother was having an affair, two teenage girls having their first drinks, a father allowing his little kids to eat at the dining room table instead of in the kitchen, an author writing her book…..might be my favorite play. Crown Hill reminded me of that work. I smiled more than once.” - Peter H.
“Your central premise of the home being a living entity draws the reader right in. It creates a familiarity that resonates for anyone who has ever lived in an older house – one with “history”. And your imagery is magic. Tastes, textures, fragrances, personalities… You allow the reader to connect to these people and their history. Job well done, my sister!” - Noa B.